If you’re playing best ball fantasy football leagues, avoiding missteps is crucial. If you mess up a draft pick in redraft leagues, you can be a savvy trader or a waiver-wire wizard and salvage a year. In best ball, there is no salvation. If you screw up the draft, you screwed up the year. With that in mind, this week we’re taking a look at some potential bust candidates in best ball leagues in 2019. Some of these players might be better redraft options than best ball, some might just fail to meet ADP, and some might fall apart altogether. Either way, think twice before drafting these players in your 2019 best ball drafts. You could argue for Gurley as the obvious potential bust from the elite, but just because it could be obvious doesn’t mean it shouldn’t be mentioned. We saw Gurley all but disappear for the Rams in the Super Bowl, as the offense sputtered and C.J. Anderson took touches. Gurley averaged 58.9 offensive snaps per game in Weeks 1-15, before Anderson was on the team. 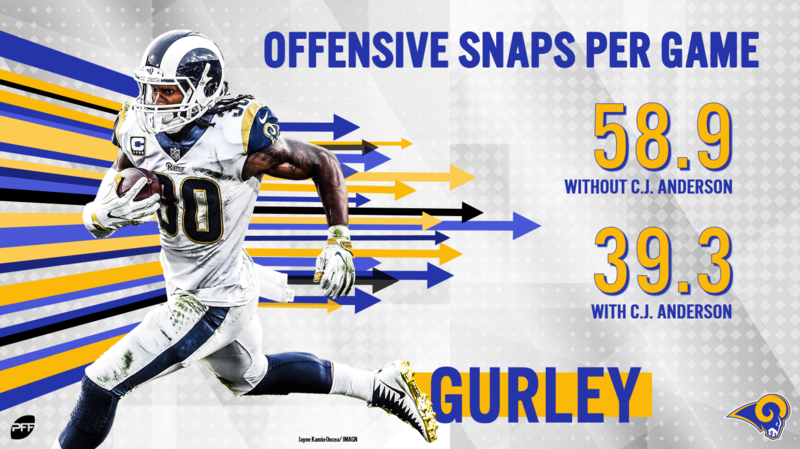 After Gurley missed Weeks 16 and 17 and Anderson put up strong numbers, Gurley returned for the playoffs and averaged 39.3 snaps in the postseason. His PPR per-game average fell from 26.7 before the team’s bye to 17.9 after, and that even includes two multi-score games in that stretch. Anderson remains a free agent as I write this, but the team has said it would like him to return, meaning he could continue to steal snaps. Should Gurley be fine? Yeah, that’s why he’s pretty universally top-five. But there’s risk there now that there wasn’t a few months ago. Bell missed basically all of training camp in 2017, then started 2017 with 3.5 yards per carry, the 15th-most RB PPR points, and a 54.7 PFF rushing grade that was 42nd of 57 qualified running backs through Week 3. He got better from there, of course, and ended the year as RB3. Missing a season and playing in training camp is different than just missing training camp, but that is still true. Meanwhile, Bell is only 27, but he has the 24th-most touches through a player’s age-26 season all time despite missing an entire season and only playing 62 of a possible 80 games otherwise. 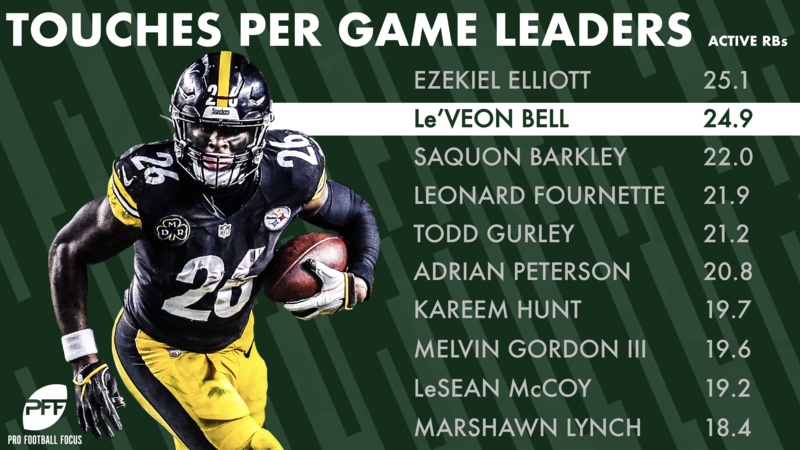 He’s averaged 24.9 touches over his career, 0.2 behind Ezekiel Elliott (who is only 23) and almost three full touches per game ahead of any other active player (Saquon Barkley is third at 22.0). Bell should be excellent in 2019. But his legs are older than a 27-year-old’s legs off of a year’s absence should be. Williams was the PPR RB2 over the last four weeks of the season, well behind Derrick Henry’s ridiculous close to the year but ahead of everyone else. He did that with only 352 yards from scrimmage (good, but hardly ridiculous — barely a top-10 number), but a much more impressive six total touchdowns. That’s despite fairly middling deeper numbers. And as noted by FantasyPros’ Mike Tagliere (formerly of PFF), this time two years ago, one year ago, even five months ago, would you have taken Williams or Carlos Hyde? It would have been close to unanimous for Hyde. Williams should have the first and main shot at the Chiefs job in 2019, but don’t be surprised if he loses more work than expected to Hyde. Is Guice going to come back good to go in 2019 after tearing his ACL in his first preseason game and missing his rookie season? I hope so! At the same time, you have to consider the chances he doesn’t, or that if he does, Washington doesn’t push him that hard. After all, this is a team that is not in great shape to be competitive in 2019 and still has Adrian Peterson under contract. Maybe they ease Guice in to start the year, or even ease him in for his full season, preferring to keep him healthier for future, more competitive seasons. I like Guice and think he’ll have a good career, but in best ball structure where you can’t call a Mulligan on a bad pick and go waiver searching, I think his risk is too great. Ingram’s move to Baltimore should mean good things for the security of his workload, but I fully expect him to be a high-floor, low-ceiling type as a Raven. Lamar Jackson famously didn’t throw much, and he targeted running backs even less often. 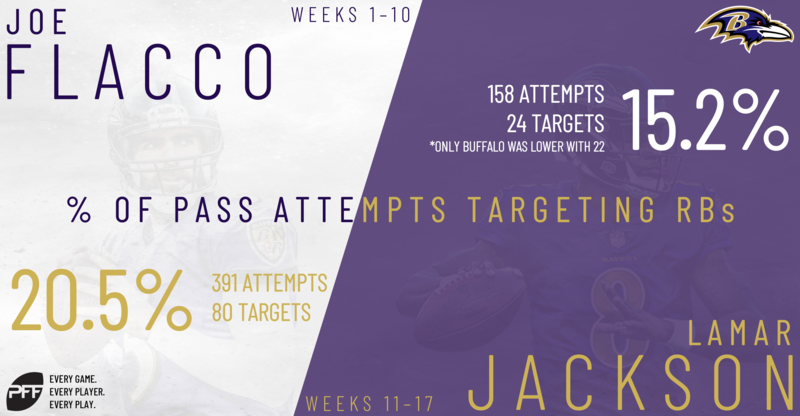 Ravens running backs totaled 24 targets in Jackson’s starts (only the Bills’ 22 was lower), with Jackson targeted the position on 15.2% of his attempts. Through Weeks 1-10, the position receiver 20.5% of the team’s targets. Ingram might get a lot of carries, but in best ball (ever 0.5 PPR best ball), you need more of a receiving ceiling than he’ll offer as a Raven. 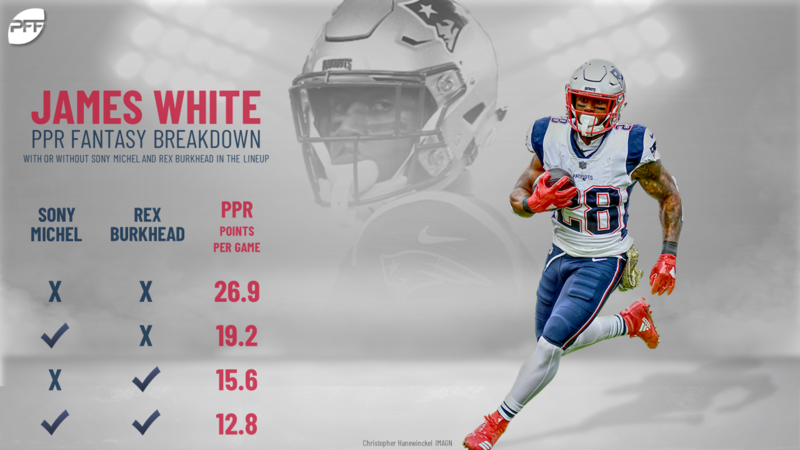 White’s ADP and rank are lower than his 2018 finish, showing that some of this is already baked in, but even taking him at RB25 (his current BestBall10 ADP) is going to be risky if Burkhead and Michel stay healthy in 2019.